Gittins has a talent for drawing out from the minutiae of life the tiny, gritty details that breathe life into narrative, while imbuing it both with humour and pathos. This keen eye reveals the grief of seeing one parent battling mental illness early, while another is later eroded by dementia. The cruelty of these struggles is laid plain across the page with a grace that makes you want to read on. As in reality, tragedy and comedy rub together in a way that few writers have the skill to convey. Gittins has been compared to Alan Bennett, and I can understand that analogy. For me though, she shares prowess over the everyday with the likes of Mavis Gallant and Katherine Mansfield – great literary gatherers with the ability to coax out a wealth of insights from painstakingly excavated oddments. Towards the end of the books there’s a beautifully contemplative section that caught my imagination. In a similar way, Gittins’ writing is lined with evocations – rescued, carefully polished and lifted up for all to see. 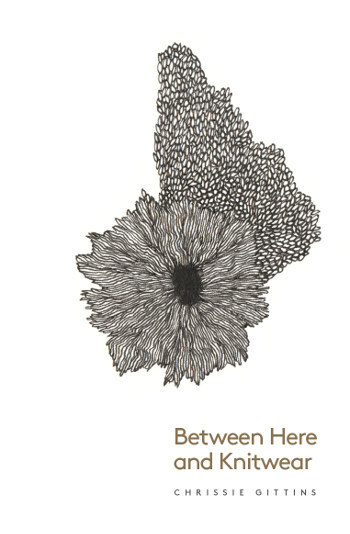 Between Here and Knitwear by Chrissie Gittins is published by Unthank Books. This entry was posted in Reviews and tagged Between Here and Knitwear, Book reviews, Chrissie Gittins, Unthank Books by Judy. Bookmark the permalink.